Let’s continue with our “cool things to do with old drawers” Decor Quick Tip miniseries, shall we? As mentioned previously, this is but one of the many clever and quirky dresser drawer DIY ideas we’ve stumbled across. We are really enjoying this playful series! Be sure to check out the previous drawer tips, “Old Drawer Turned Table”, “Under Bed Drawer Storage” and “Old Drawer Turned Tray” … just in case you missed it. #54 Looking for a fun way to add additional storage to your space? Why not repurpose an old and unwanted dresser drawer into upcycled wall storage. 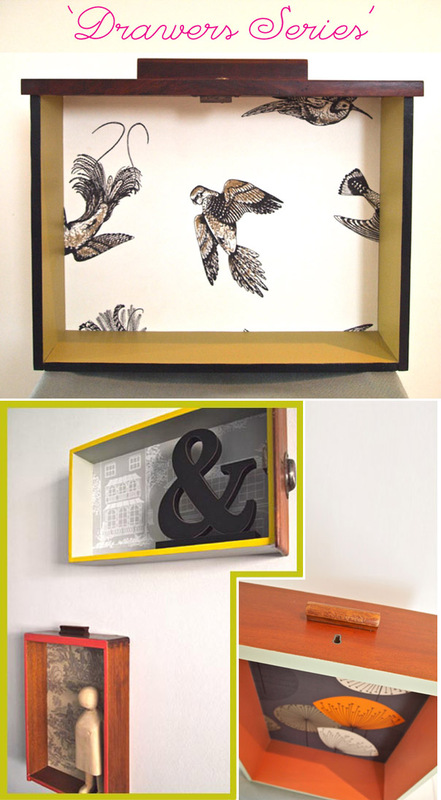 Attach the bottom of your drawer (or a grouping of drawers) to the wall to create a quirky and eye-catching wall shelf. You can use it to display decorative items or as a catch-all storage for everyday things like keys and letters. To further enhance your drawer’s appeal give it a lick of bright paint and apply an attractive wallpaper or wrapping paper to the inside of the drawer bottom. For a slightly different effect, attach the back of a drawer to the wall to create a cantilevered wall box – drawer front and handle facing out. Use it to store and display books, plants, or even toiletries and towels in the bathroom. It can even serve as quirky bedside storage (as shown above). Today we continue our “awesome stuff to do with old drawers” Decor Quick Tip miniseries. As I mentioned previously, we have found many of these clever and unusual dresser drawer DIY ideas. These tips are so quirky and playful, we are really enjoying the series thus far! Be sure to check out the previous drawer tips, “Old Drawer Turned Table” and “Under Bed Drawer Storage“… just in case you missed it. #53 Looking for a quick and easy DIY weekend project? Repurpose an old and unwanted dresser drawer into an upcycled storage tray. Both functional and decorative, it is perfect for creating a decorative coffee table vignette or to serve as a quirky drinks tray. Choose your drawer wisely. For this particular DIY undertaking a shallow, box-like drawer (i.e. a drawer without an overlapping drawer front) will work best. Give your drawer a bright lick of paint or leave it natural or distressed if you prefer a rustic or Shabby Chic style. Add an interesting knob or handle that will complement your chosen style. 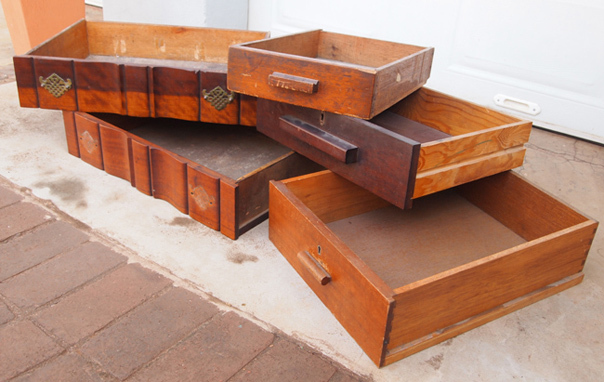 #52 Have any old and unwanted dresser drawers gathering dust in the shed? Hold a sec before you toss it! Why not repurpose that old drawer into a quirky side table. All you have to do is attach some salvaged legs to the bottom of your drawer (even the folding legs of a TV tray would work). 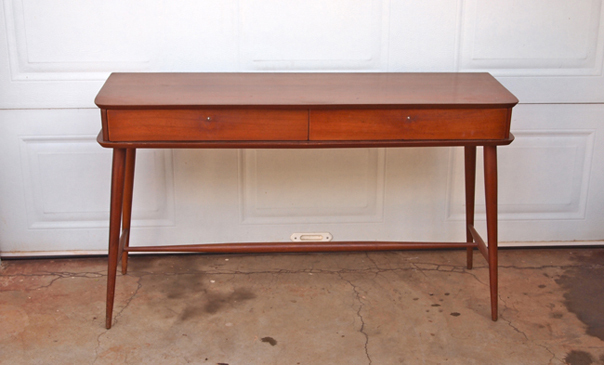 The style of your upcycled table will take cue from the drawer and legs you choose to use. Attach some tapering wooden cone legs for a Mid-century feel or use metal filing drawers for a more Industrial look. Give your drawer a fresh coat of paint or leave it natural or distressed if that is your chosen style. Choose a knob or handle that will complement your chosen table legs. Images Sources: The Driftwood Home, Decor Viva! & Happy Together. I recently stumbled upon some pretty clever and quirky DIY ideas on things to do with old dresser drawers. Of course I immediately thought about turning all these interesting and playful ideas into another Decor Quick Tip miniseries…. Jess founded interior design company, Hector & Bailey in London in 2009 in defiance of the recession and moved across the globe to Durban. Seeking a bit of sunny skies and warm weather, where you Jess? – well, either way, we are super happy to have you join the South African ranks! I also just had to share two of her Before & After pieces – it is truly amazing how a good sanding and a lick of paint can transform these articles into trendy desirable pieces. I especially love the collection of tossed drawers she revamped. A pop of bright colour and some funky wallpaper, and now they are most gorgeous wall shelves or boxed displays. More exciting news… Jess is going to be doing a DIY guest post for us next month where she will be showing us step-by-step how to transform something old into something new… so, keep your eyes peeled! Do yourself a favour and pop over to Hector & Bailey to see more of Jess’s Found & Fixed beauties!